ROME (CNS) — U.S. Archbishop Alexander K. Sample was preparing to celebrate Mass Oct. 26 with Benedictine monks in Norcia when the first of two powerful earthquakes struck. “I had no sooner finished (the vesting) prayer to be protected from the assaults of Satan when bang: It just hit and it hit with a vengeance. It didn’t last very long, but it really shook the building we were in,” Archbishop Sample of Portland, Oregon, told Catholic News Service in Rome the next morning. No casualties were reported from the quakes. According to the U.S. Geological Survey, an earthquake measuring 5.5 struck shortly after 7 p.m. local time and a 6.1 magnitude quake followed two hours later. Both were centered in Italy’s Marche region, not far from Norcia. Archbishop Sample and other Portland pilgrims were visiting Norcia, the birthplace of St. Benedict, during a trip to Italy for the fifth annual Populus Summorum Pontificum pilgrimage, an international gathering for Catholics devoted to the extraordinary form of the Mass. 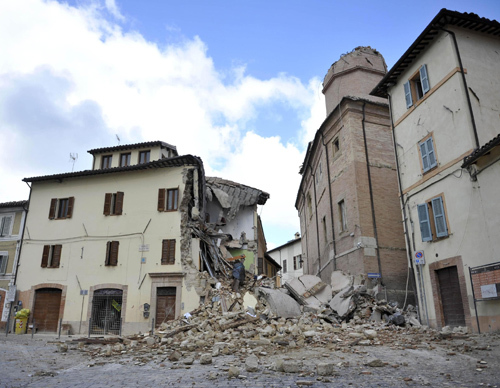 Speaking by telephone from Norcia, the archbishop said that despite feeling aftershocks during the Mass, he finished celebrating and was already in his hotel room when the second earthquake struck. Although things seem to calm down, “there were a number of aftershocks” throughout the night, he said. 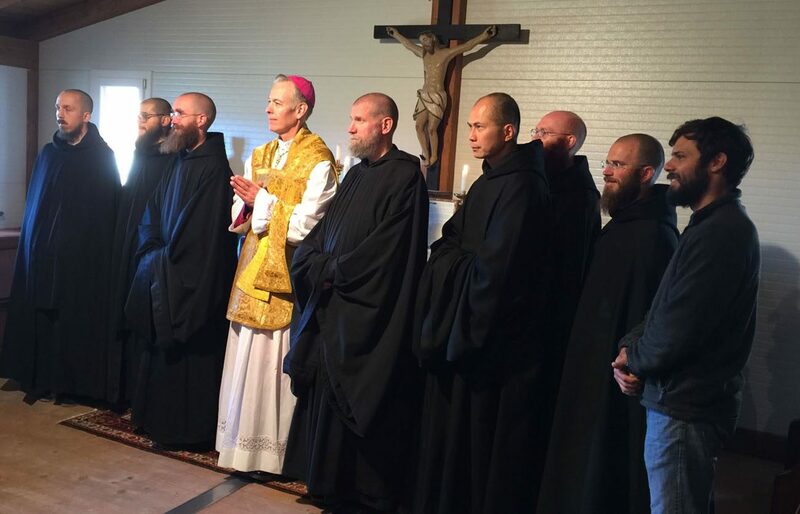 While Archbishop Sample was with the Benedictine monks, he said another group from Portland, led by Father John Boyle, also had “a harrowing experience” during the earthquake while celebrating Mass in the crypt of the Basilica of St. Benedict in Norcia. “Father Boyle was just beginning the preparatory prayers for holy Communion when it hit and he took shelter underneath the altar and instructed the other pilgrims to take cover under the pews,” the archbishop told CNS. When the earthquake ended, Archbishop Sample said, the pilgrims went outside the church and Father Boyle brought them Communion. The archbishop said that Father Boyle found it “very moving to see the people kneeling on the ground to receive holy Communion; it was beautiful.” After Mass, several monks helped retrieve the pilgrim’s personal items from the church before they returned to their hotel. The earthquakes, which came two months after a powerful quake devastated several towns in the region, left several churches with major damage. Avvenire, the newspaper of the Italian bishops’ conference, reported that one of the destroyed buildings was the 13th-century church of San Salvatore in Campi,” just outside the center of Norcia. The rose window of Sant’ Eutizio Abbey, one of Italy’s oldest monasteries dating back to the 5th century, also collapsed following the first earthquake. The 6.1 quake Oct. 26, the U.S. Geological Survey said, “is currently the largest aftershock” of the Aug. 24 quake that struck central Italy. The epicenter of the August earthquake was close to Norcia; with a magnitude of 6.2, it caused the deaths of close to 300 people.